Do You Make a Monthly TBR? Let’s Get Things Started Back up Here…. Ready When You Are, C.B. WILD THINGS! | WILD THINGS! Readalongers – Gone with the Wind. Kidlit Celebrates Women's History Month Year 5! Georgian Era can be defined as either 1714-1830 OR 1744-1837. 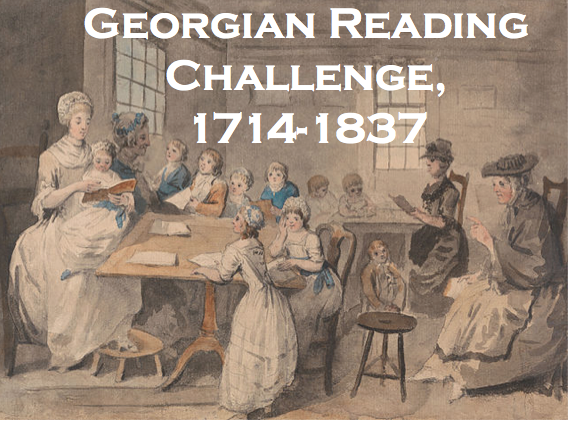 You may choose how you want to define it in terms of the reading challenge. It covers the reigns of George I, George II, George III, and George IV of England. (If you go with the later definition, it also includes the oh-so-brief reign of William IV.) This includes the REGENCY PERIOD but is more inclusive. There will be seven check-in posts. February 16, 2019; April 6, 2019; May 18, 2019; July 6, 2019; September 7, 2019; November 2, 2019. December 28, 2019. IF you love reading AND you happen to love tea...consider joining my Share-a-Tea reading challenge. Novels, poems, plays, short stories, novellas, letters, diaries, essays, nonfiction published in Great Britain (or its colonies) during the Georgian era. Nonfiction books published about the Georgian era. Including, of course, biographies on the royal family. Historical fiction set during the Georgian era. Movies and television series set during this period--if you review them--can count. But try to keep things balanced. You may make a list if you want to plan ahead...or read according to your whimsy. You may follow me on twitter @blbooks. I'm signing up for the challenge. I'll work on a post about it. Thanks Becky. I'm always happy to hear from you! To help fight spam, comment moderation has been set up for posts older than two days. Feel free to ask me questions or ask for recommendations! No one has permission to reprint my reviews on their own site. Even if they give me a link. It’s Monday! What are you Reading this Easter? An Allergic Foodie Is Back! This Week On: It was such a good reading week. Back to the Classics 2018 wrap-up! OMG! By clicking subscribe you are agreeing to receive emails by FeedBlitz. (You will need to confirm the subscription). I will be updating the blog at least once a day. (Sometimes several times a day.) If that is too often for your inbox tastes, consider subscribing to the rss feed (like in google reader, etc.) instead. You can UNSUBSCRIBE at any time. I do use an https:// address. I offer an email subscription of my posts using FeedBlitz. You may choose to subscribe by providing your name/email address. I believe a confirmation email is now sent to confirm your subscription. (This may not have been the case in the early days of the service.) You may UNSUBSCRIBE at any time from the service by following the directions on the email. I use the FREE plan of Feedblitz, so there will be ads. I do not profit from those ads. I have no control over the content of those ads. I currently use a free (and very limited) version of stat counter. The information that I see is how many visitors the blog gets per day, per week. This information is emailed weekly. Because I’m exceeding my “free” data limit, ALL information gets deleted within a week according to the site. Only the past five days are kept at any time. I do not personally have access to most of the data because I am using the free plan. Comments. I do not require a name or an email address to comment on the blog. You may choose to comment while logged into an account, but it is by no means a requirement. If you decide to delete a comment you’ve left, I believe you can do that yourself. IF not, you may email me and I will look into deleting it for you. I do not host giveaways. I will not ask for your name or email for any contest or giveaway. So I will certainly not be storing it. The blog does not publish automatically to any social media. I sometimes do share my posts on Facebook. But I do that manually. I do link to other sites. Other sites may or may collect data. I am not responsible for anything you do on other sites. I use Blogger powered by Google to blog. I have no interaction/control over what information or cookies they may be collecting when you visit the site. Visiting this site is optional after all. Becky has read 0 books toward her goal of 520 books. I am interested in reviewing books and audio books. This blog focuses on books written for middle grade on up (essentially 10 to a 110). I review middle grade fiction and young adult fiction (aka tween and teen). I also review adult books. I read a few poetry books, a few short story collections, a few graphic novels, a few nonfiction books. I am more interested in strong characters, well-written, fleshed-out, human characters. Plot is secondary to me in a way. I have to care about the characters in order to care about the plot. That being said, compelling storytelling is something that I love. I love to become absorbed in what I'm reading. If you're interested in sending me a review copy of your book, I'm happy to hear from you. Email me at laney_po AT yahoo DOT com. 1) I do not guarantee a review of your book. I am just agreeing to consider it for review. 2) I give all books at least fifty pages. 3) I am not promising anyone (author or publisher) a positive review in exchange for a review copy. That's not how I work. 4) In all of my reviews I strive for honesty. My reviews are my opinions--so yes, they are subjective--you should know my blog will feature both negative and positive reviews. 5) I do not guarantee that I will get to your book immediately. I've got so many books I'm trying to read and review, I can't promise to get to any one book in a given time frame. 6) Emailing me every other week to see if I've read your book won't help me get to it any faster. Though if you want to email me to check and see if it arrived safely, then that's fine! Authors, publishers. I am interested in interviewing authors and participating in blog tours. (All I ask is that I receive a review copy of the author's latest book beforehand so the interview will be productive. If the book is part of a series, I'd like to review the whole series.) Contact me if you're interested. What it is worth knowing about preparations, for intimate life improvement? Chloe Neill’s Chicagoland Vampires’ 10th Anniversary! Judging Applications for the 2019 INSPY Awards are Now OPEN! QUIZ: What Kind of Valentine's Day Card Should You Send Your Crush? Rappin' Puppet on A Christmas Carol! My first published book is available now! Book Dads: Fathers Who Read! Happy World Read Aloud Day! ### Compare Auto Insurance Quotes!! Under Construction.....a New Blog for a New Year!!! Place, Writing, and a Wonderful Southern Writer! The Up side of Insanity. What Should I Read Now? Winner: What Would You Study? Are you there youth? It's me, Nikki. Top Ten Tuesday: what was it about again? My first post of the year!